The EForce mission is to holistically develop the total athlete, both in and out of the competitive arena. By utilizing core principals of the widely recognized Long Term Athlete Development Model in all programs, EForce ensures optimal growth for all participants. LTAD is a stage-by-stage approach that gives every child, youth, and adult the greatest opportunity to engage in lifelong, health-enhancing physical activity, and ultimately maximize their athletic potential. This is achieved by encouraging multi-sport participation and proper development-to-competition ratios. For those not participating in competitive sports, our aim is to develop healthy lifestyle strategies and fitness goals to remain active for life. We strongly encourage multi-sport participation for all athletes. Our programs have a strong emphasis on year long development - with appreciation for all external activities and sports. At all times we will utilize age-appropriate training. Our staff helps develop strategies for long term health and fitness goals to be active for life. We strive to develop athlete resiliency - both physically and psychologically. We provide mentorship both in and out of training settings. We will foster a supportive culture for athletes of all ages and abilities. We are committed to developing partnerships with other organizations to improve athlete growth and development in the area. Technical training deals with developing the required skilled movement for the given sport or activity, and is typically performed using closed (predetermined) drills. All technical movement - stance, footwork, ball handling, etc. - should be executed according to key performance points. Emphasis is on repeating key movement patterns to convert a cognitive motor patterns into autonomous patterns requiring little conscious effort. Tactical training is concerned with the X’s and O’s, sport specific decision making, and reaction to situations. This is usually trained using open drills requiring a reaction to an external stimulus, forcing the athlete to respond. Interactive 1on1, small-sided games, and running plays fall into this category. Tactical training puts the technical tools to work. Physical training prepares the athlete to perform maximally in their specific sport. It not only builds appropriate strength, power, endurance, agility, and mobility, but also develops the coordinated movement required for technical mastery. Physical training underpins both technical and tactical performance by ensuring that an athlete can physical execute the technical movements and strategies at the required intensity and duration with minimal fatigue. Psychosocial looks at individuals in the context of the combined influence that psychological factors, and the surrounding social environment have on their physical and mental wellness, and their ability to function. This includes how an athlete performs in mentally challenging situations and how they responds to players and coaches. It also like a how athletes execute the technical and tactical while under different situations to evaluate their mental resilience. What does the E in EForce stand for? Education. Our main goal at EForce is to provide the proper tools to lead an active and healthy lifestyle. We seek to accomplish this by educating each participant in all aspects of health, fitness and training. How does LTAD apply to me? No matter what stage of athletic development you fall into, everyone is a part of the Long Term Athlete Development Model. LTAD starts at birth with the Active Start stage and progresses through adulthood to the Active for Life stage. At EForce we provide the proper programs for each age group so they can maximize athletic potential and ultimately lead an active and healthy lifestyle. Where/How do I get started? Click here to contact us and inquire about any of our programs! 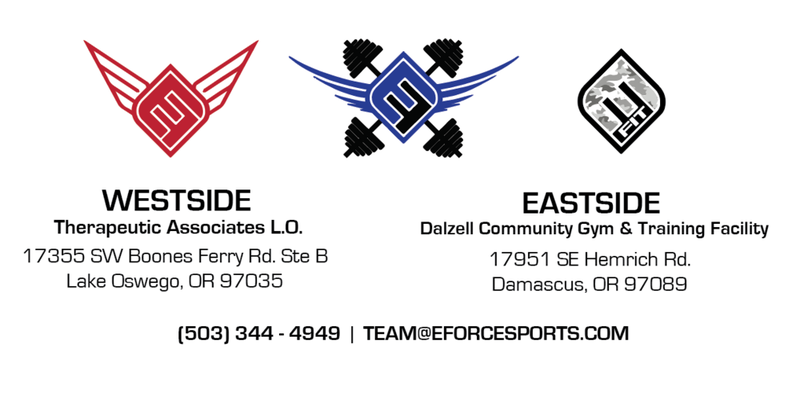 Are EForce 7v7 teams like AAU basketball or other Club programs? No. 7v7 football is strictly a skill development tool that allows athletes to avoid the physical pounding of extra tackle games in the off-season. Unlike other club type programs, our teams adhere to the LTAD model by ensuring proper Development-to-Competition ratios (8 development sessions-to-1 competition). In no way do these 7v7 teams replace the importance of participating with your high school/youth tackle football team. EForce 7v7 teams are a great way to compliment any skill training you are already doing with your high school/youth coach. Are there football training opportunities for all ages? Yes! We offer camps, small group training and individual training for athletes of all ages. Why should I spend time honing my football skills out of season? Just like hitting in a cage in January or shooting free throws in July, it is essential for football athletes to continually work on their skills in the off-season. In addition to being one of the most physical sports, football requires very specific movements for each position to learn. By utilizing the EForce training programs you will be able to get better no matter what skill level and position. Can I participate with EForce while I am playing other sports? Yes! We encourage all athletes to play multiple sports, so all of our programs fit in the margin of your other athletic endeavors. Never will we require you to leave a sport you are competing in to attend an EForce event. What is a good age to have my child start training? Can I do Performance Training during my sport season? Yes! It is actually very beneficial to do training in-season. Many athletes spend countless hours in the off-season working to develop themselves to their peak potential for their season. Unfortunately, many of these same athletes neglect to continue training during the season, leading to a decrease in speed, power, strength, and conditioning when it matters the most In-season training helps athletes to maintain their abilities while addressing any potential injuries as they come. What is the distrubution of speed, power, and strength training in your training sessions? Our training is not a one size fits all. Based on many factors including an athletes goals, needs, age, injury history, etc. we develop training programs that are holistic in nature. This give each athlete the specific amount of sprinting, jumping, lifting, correctives, conditioning, etc. they need to help them reach their individual goals and athletic potential. Can I still train even if I'm injured? You can absolutely train, and should still train while working through an injury. EForce Performance is strongly connected with many medical professional that are great resources to us. We as coaches are extremely knowledgeable to training modifications to help athletes continue to develop and reach their goals, while working through their physical therapy protocols. We often times integrate these physical therapy exercise into their training as well to help speed up the recovery process. What can we do outside of these training session to help maximize my results? One of the many benefits our training with us is that we continue to give you strategies to maximize your results outside of your training session with us. From handouts covering topics including habits of successful athletes, nutrition/hydration, recovery, and goal setting, to extra workouts that compliment what you're already to with us. Athletes that train with EForce will be given all the tools they need to reach their peak performance.